Watching Distortion of Time, I couldn’t help but to think “old school” (and thus purity) what with their Chuck Taylor shoes and clean vocals. Even their age differences highlighted this dynamic. This is also how I feel about bands like Mötley Crüe. So, you can imagine my surprise when they informed the crowd it was their first show. The formula was there! An experienced lead guitarist and drummer, talented bassist and rhythm guitarist, with a vocalist who had a wide range. They were very talented and have great potential. If you like Metallica and Disturbed, then you’ll probably like this band. I might have heard a couple of “Oh yeah”s in the lyrics, but in the best way possible. This is what you listen to when you’re off roading in a 97′ Jeep Wrangler while the girls are at spa. In other words, it was like masculine music you jam with the bros. Actually, a lot of guys in the crowd were wearing bent baseball caps like most rock crawler drivers wear. What a great amount of galloping riffs and double bass drums. The drumming was superb and I’m not just saying that. 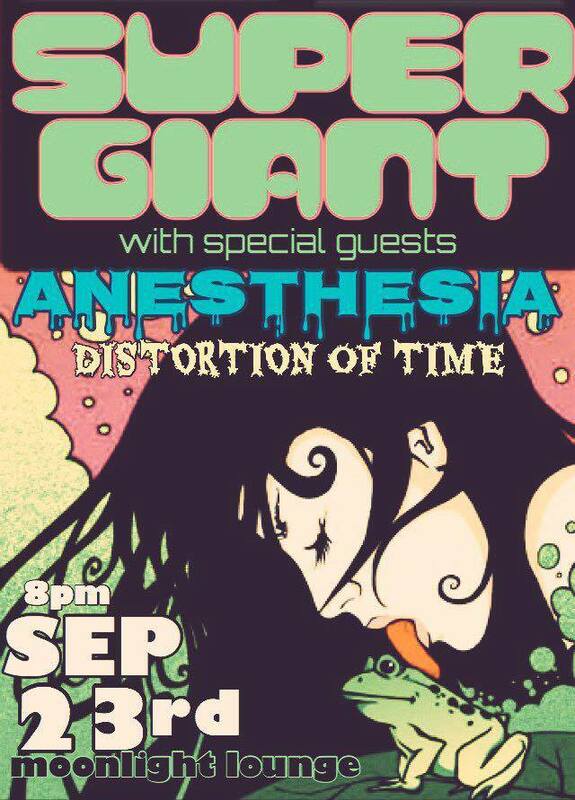 At some points, Anesthesia would almost sound like southern rock. Plain and simple; I loved it. As a traditionalist metal head, I don’t go out of my way for bands similar to CKY, Foo Fighters and Clutch, even though I enjoy listening to them from time to time. However, Supergiant is a band I’ll keep in the ol’ radar. They entertained the hell out of me. Their front man, with animated gestures and deep heavy riffs, made me forget where I was. At first it was almost punk, like Clutch, but then slowed down to almost doom status. They carried themselves perfectly throughout the show and I can’t wait to see them next time.